Somatic hybridization is a technique which allows the manipulation of cellular genomes by protoplast fusion. Its major contribution to plant breeding is in overcoming common crossing barriers among plant species and in organelle genetics and breeding. 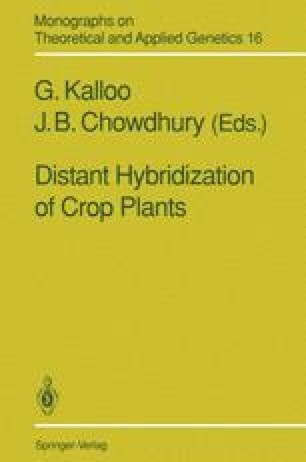 Several reviews on different aspects of somatic hybridization were published recently: Pelletier and Chupeau (1984), Gleba and Sytnik (1984), Lazar (1983), Harms (1983), Fluhr (1983), D.A. Evans (1983), Galun and Aviv (1983), Schieder and Vasil (1980), Kumar and Cocking (1987), and Sink (1988). Several steps are involved in the somatic hybridization process such as (1) the source of protoplasts, (2) the isolation of protoplasts, (3) plating of protoplasts, (4) regeneration of plants, (5) fusion of protoplasts, (6) selection procedures, and (7) identification and characterization of the somatic hybrid plants. These steps will be reviewed and the significance of somatic hybridization as a tool for crop improvement and some examples of application to specific crops will be discussed.